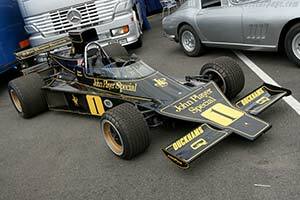 A replacement for the aging Lotus 72 was long overdue when the Lotus 76 was launched in 1974. The 76 featured an electronic clutch which could be operated by a gear lever button. It was also fitted with an aerodynamic novelty; a biplane rear wing. For the drivers the 76 was a disapointment and both new features were removed after the first tests. After four races the team went back to use the 72 or hybrids of the 72 and 76. In the four races run Ronnie Peterson finished once, in fourth place.